This C-SPAN image of Mr. Beale appeared on online news sites Monday. Well, speaking of climate change, one of the federal government’s policy experts on the subject turns out to have been a crook. He is John C. Beale, 65, who is scheduled to be sentenced in Washington Wednesday after pleading guilty to defrauding the government by drawing almost $1 million in pay and benefits while doing no work whatsoever for months at a time. 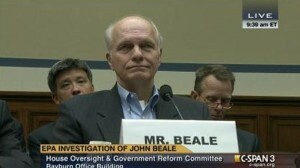 Beale had been a senior policy adviser to the Environmental Protection Agency’s Office of Air and Radiation. News stories called him the EPA’s top climate expert, who led U.S. delegations to international climate conferences in 2000 and 2001. Since then he would sometimes stay away from the office for months, falsely telling colleagues he was working for the CIA, once that he was needed in Pakistan. Instead, NBC News reported he spent the time relaxing at his home in Virginia or his vacation place on Cape Cod. It took years for his supervisors, including the current head of the EPA, to become suspicious, and more time before an investigation uncovered the truth. He officially retired in 2011 but kept drawing his paycheck, which was reported to top $200,000 a year in salary and bonuses. Well since when has this administration ever expected their “experts” to actually know squat about what they’re paid to report on or more importantly to regulate.